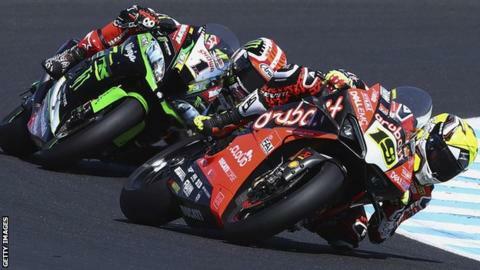 Alvaro Bautista beat Jonathan Rea into second place for the fourth time in a row to continue his winning start to the World Superbike season in Thailand. The Spaniard, 34, overtook early leader Rea with 12 laps to go and pulled away to make it four wins out of four and extend his series lead to 18 points. The Ducati rider began his first year in the series by taking a treble in round one at Phillip Island last month. The 10-lap Superpole race and the 20-lap race two will take place on Sunday. Kawasaki-mounted Rea made Bautista work hard for his victory but the power advantage of the former MotoGP rider's machine on the long straights proved crucial and he ran out the winner by 8.2 seconds. The pair touched going into turn three on the third lap of 20 at the Chang International Circuit in Buriram but both managed to stay on. Four-time world champion Rea said afterwards that he was "riding on the edge" to try and challenge pole position man Bautista for the victory. Rea, 32, is aiming for a fifth straight title while former 125cc champion Bautista has made the move to WSB after nine years competing in MotoGP. Rea went into the weekend with a record of six race wins and one additional podium finish from eight starts at Buriram, including double successes in 2015 and 2017. England's Alex Lowes was third on a Yamaha, with Dutchman Michael van der Mark, Leon Haslam and Marco Melandri making up the top six. Eugene Laverty crashed out unhurt on lap four while Welshman Chaz Davies was also a faller, but he re-mounted to take 15th place. After Sunday's races the championship moves to Europe for the next six rounds, beginning with Aragon on 6 and 7 April.